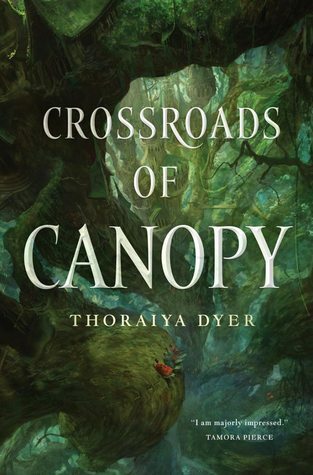 Thoraiya Dyer’s Crossroads of Canopy was one of my most anticipated debut novels of 2017, and I’m pleased to report that it did not disappoint. Crossroads is a truly tremendous book, full of fantastically original worldbuilding, fascinating mythology, and a cast of compelling characters led by one of my favorite fantasy heroines in a very long time. It’s a gorgeously magical and delightfully challenging novel that only gets lusher and more incredible the longer you read it. Things start off promisingly with the introduction of Unar, an abused child about to be sold by her parents, and Dyer does a good job in the opening couple of chapters of introducing the city of Canopy and something of its societal structures and religion. Things quickly shift gear, however, when Unar evades enslavement by pledging herself as a servant of the life/fertility goddess, Audblayin. This initial transition and subsequent time jump–about ten years–are more than a little jarring, verging on confusing, and the rest of the first half of the novel often struggles with keeping a good pace and maintaining connections between many moving parts. It makes for a slow start to the book that may be offputting for less dedicated readers, but I still found Unar’s story gripping enough to keep reading, and it pays off big time in the back half of the novel, where things get amazing. In the end, I loved the deliberateness of the way the tone and depth of the story reflects Unar’s character growth. We start the journey with her as a young child, inquisitive about her world, engaged in what’s going on around her, and this is reflected in the vividness of the opening chapters, in which Dyer paints a clear picture of the world of Canopy. As a teenager, Unar has become ambitious, but also self-absorbed, convinced that she has a great destiny, obsessed with achieving it, and resentful towards anyone who she sees as an enemy or impediment (and that’s basically everyone). She chafes at the restrictions of Audblayin’s Garden, flouts rules, and ultimately takes actions that force her onto a very different path than what she thinks she deserves. Most of Unar’s story, then, is about Unar’s long, painful struggle to understand her world and her place in it, and the way that Dyer deploys worldbuilding details reflects that, taking the reader on the same journey that Unar must take from disconnection to understanding. It makes for somewhat frustrating reading early on, but the payoff at the end, when so many things really come into focus for Unar–and for the reader–is well worth the wait. Unar herself is one of the most fascinating and infuriating and deeply lovable protagonists I’ve read about in years. I love her pure, unadulterated stubbornness and grit and her dogged belief in herself, even as she grows to learn that her destiny–if it is a destiny at all–isn’t what she wanted it to be. I love Unar’s ability to make mistakes, even disastrous ones, and still keep going because even when she doesn’t have a clue what she’s doing, she can’t stand to give up. Most of all, I love Unar’s ever present drive to be better. She has a strong sense of justice that evolves and grows over the course of the novel as she comes to think more of others and learns more about the world outside herself. Crossroads of Canopy is Unar’s coming of age story, but more than that it’s a story about Unar’s political awakening. I have long had a soft spot for difficult women as protagonists, and Unar is exactly the kind of character I want to read about these days. Certainly she grows up in many ways throughout this book, but Unar’s deeper and more important journey is to figure out where she fits into an imperfect world and how she can leverage her strengths–both personal and magical–in order to fight the injustice she is still slowly coming to understand at the end of this story. I cannot wait to find out what Unar does next.